Website includes information on destructive termites, termite control options, termite inspections, termite baits including TermatriX Termite Baiting System. Termidor is owned by BASF based in Mount Olive, New Jersey USA. It is the biggest selling termiticide in the USA and is now used in Australia, Japan, France and most other countries where subterranean termite infestations are a severe economic problem. In fact, Termidor has been used in more than a million homes with safety and effectiveness. Thoroughly tested The US Dept of Agriculture - Forestry Service, has tested Termidor for more than 10 years. So far, results show 100% effective termite barrier protection. The best alternative and main competitor in the marketplace is Premise termiticide, owned by Bayer Environmental Science. Soil treatment Termidor is applied by licensed pest controllers to soil areas abutting a building in order to eradicate termites as they attempt to gain entry into the building - provides immediate protection - lowers the risk of on-going timber damage from a termite infestation. The same cannot be said for termite baiting systems. Leave it to the experts The installation of a chemical soil barrier requires expert knowledge and specialized equipment to form a complete and continuous barrier to protect the building from a termite entry and infestation. Deadly transfer effect Termites working in soil with a low concentration of Termidor, such as, in the out-reaches of a Termidor treated soil area, will not detect it's debilitating effect until a few days later - enough time to routinely transfer the Termidor active ingredient to other termites during mutual feeding and grooming. The delayed lethal effect of Termidor is highly successful at eliminating the entire colony. Beware of inferior alternatives Termidor is not the only termiticide on the market but it is the best. Old fashioned alternatives products are repellents designed to repel or keep termites away from a treated soil area, rather than killing them. This means any minute gap in the treated soil can be detected and exploited by the termites to gain entry in the building. This is a major short-coming of the old-fashioned termite control alternatives, far too often, with financially disastrous consequences. Termites tunneling in higher concentration Termidor treated soil areas abutting the building, are killed outright, within a few hours. Termites tunneling in the outer reaches of a Termidor (lower concentration) treated soil area, cannot detect the Termidor chemical which readily sticks to the termites' body. These termites remain unaffected for a few days, before sudden death occurs. This delayed lethal effect provides enough time for the Termidor chemical to be transferred back to the nest to infect other termites. The "carrier" termites are able to readily spread the Termidor chemical to other termites during regular physical contact with other termites in the colony, particularly when working together in close proximity, grooming and feeding other termites, a regular function of their daily life. Termites cannot detect the Termidor chemical as it has virtually no odour, taste or smell to the termites. Termites cannibalize or carry away dead termites killed by the Termidor on their bodies, further spreading Termidor's deadly effect to other termite colony members. If you have termites in your property, we recommend you discuss the problem with the neighbours. Obviously, several homes close by each other with a Termidor treated soil barrier, will greatly increase the chances of successful termite colony elimination, for the benefit all concerned. Based on our extensive testing, published results of field trials by regulatory authorities and the manufacturer and other industry feed-back it appears that in respect of buildings under heavy termite infestation, a complete Termidor treated soil barrier thereto has a devastating effect on a termite colony within a few weeks. Indications are that a Termidor treated soil barrier to a building under moderate to low termite infestation, has similar results within a few months. FOR YOUR PEACE OF MIND, in the meantime, a Termidor treated soil barrier immediately protects the building from termite entry. The alternative termite baiting systems cannot provide such positive assurances and immediate protection to the building. Based on the USA and Australian field trials and laboratory testing, a Termidor treated soil barrier should remain termite control effective for 5 to 10 years in a variety of situations, if it is correctly applied at the rate required by the registered label. This means long term protection of a kind not able to be offered by any alternative termite colony baiting system. Termidor is more expensive than alternative products, so BEWARE of "dodgy" companies which undercut the required application rate in order to cut costs, which will NOT provide the level of protection neccessary. Refer our CONSUMER ADVICE section - tips on selecting a reliable pest controller. The active ingredient of Termidor is fipronil - classified as a CAUTION label product of low hazard to humans, dogs and cats. In fact, fipronil has been used for many years in the USA, Australia and other countries in the FRONTLINE flea and tick control product as used on millions of dogs and cats. Fipronil is also registered for use in a range of pest control products in the agricultural and domestic arena. Extensively tested before Termidor was made available for use in the USA it was subject to some of the toughest tests in history. For more than 8 years, so far, the USA Forest Service has tested the effectiveness of Termidor as a termite control soil barrier using the ground board and concrete slab protocol in four US states involving a variety of climate, soil types and environmental situations. Under heavy termite activity Termidor provided 100% effective termite protection. The "transfer effect" of Termidor has been observed through scientific testing using C14 radio labeled fipronil on live termites. In addition, extensive testing by the US Dept of Agriculture - Forestry Service at various sites around the USA, and other University field trials in homes in the USA indicates the transfer effect occurs. In some cited cases a Termidor treated soil barrier was applied and termites were also eliminated in nearby infested areas not so treated, such as, in nearby trees and/or buildings. The good news for the homeowner is that the Termidor soil treatment chemical will remain in place for many years even after the existing attack on your property has been eliminated. In brief, Termidor treated soil acts on an on-going basis to prevent termite entry through a treated soil area into a building or other protected structures. Such a chemical soil barrier under and around the external perimeter of a building is a pretty big target for the foraging termites to hit, rather than scattered bait stations around the building. The first step in a Termidor termite control program is for your termite controller to thoroughly inspect your premises in order to assess the level of infestation and the extent of the threat to your property. Based upon this inspection, the termite controller can recommend exactly where and how the Termidor soil treatment should be applied. Termidor comes at a premium price due to the large-scale research, development and efficacy testing costs in bringing it to the market place. The main competition product Premise has similar attributes but is sold as the "lower cost effective alternative". Premise has been used for termite control for more than 8 years and is well proven to offer highly effective termite protection. In any case, the cost of a Termidor or Premise soil treatment and monitoring program will vary depending on the size and design of the subject building, the extent of the infestation, the risk of further attack and on-going termite act ivity and other environmental factors. Where a complete Termidor soil barrier treatment is not practical or desired by the property owner - then termite monitoring and baiting system also be installed. Ring the Experts The success of a Termidor soil treatment depends heavily upon the skill and experience of the termite controller. Professional use only Termidor is more expensive than alternatives but BEWARE of "dodgy" pest controllers who cut costs by not using the correct amount of chemical. 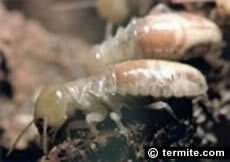 Termidor and Premse termiticides are only commercially available to licensed pest controllers. FUMAPEST Spider Identification Chart with FIRST AID spider bite procedures - a ready reference guide in full colour of dangerous and venomous spiders in the Maitland region.